Tomorrow (yes, Easter Sunday), I will be flying to Oklahoma through Dallas, Texas. I was invited by Professor Janet K. Allen to take part in a Dream Course, Understanding and Engineering Systems, at the University of Oklahoma. As I wrote in an earlier post, President David L. Boren, who has been the University of Oklahoma's long-serving President, is an avid supporter of this initiative. On Monday (yes, April Fools' Day), I will be giving two lectures. The first lecture will be in the Dream Course class and is entitled: "Grand Challenges and Opportunities in Supply Chain Networks: From Analysis to Design." The second lecture is a public lecture: "Assessing the Performance and Vulnerability of Networks from Transportation to the Internet, Financial Networks, and Supply Chains: Which Nodes and Links Really Matter? The notice for the public lecture is online on the page of the Vice President for Research. I am very much looking forward to seeing a part of the USA that I have never been to. Plus, the itinerary that has been prepared for me is wonderful and I will be meeting with faculty from the School of Industrial and Systems Engineering there and the School of Computer Science and the School of Aerospace and Mechanical Engineering, as well as with administrators. I will certainly be kept busy! Another highlight will be meeting with some students of the University of Oklahoma INFORMS Student Chapter over dinner and before my public lecture on Monday night! As the Faculty Advisor of the UMass Amherst INFORMS Student Chapter, this will be an added treat. Tomorrow evening should be an especially exciting time at the University of Oklahoma since the women's basketball team will be playing against Tennessee in the Sweet Sixteen NCAA 2013 event in Oklahoma City, which is very near Norman. I will post the full presentations after I return back to Massachusetts from Oklahoma. Yesterday, I had the pleasure of dining at the UMass University Club in Amherst, in the building which dates to 1728. The occasion was to discuss opportunities for our students, in terms of projects and internships, and opportunities for the faculty in the Isenberg School, in terms of research, that would be of interest/relevance to our guest from the Boston area. 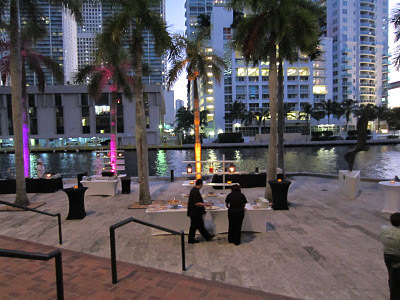 The guest at the lunch is a top exec at a financial services firm. He had met with some Computer Science faculty that morning. Our guest was a UMass Amherst alum who had graduated over 35 years ago. He was going to meet with our Chancellor after our lunch. Joining me at the lunch was a colleague of mine, a representative from the top administration for development, and also a representative responsible for UMass industry partnerships. The conversations that we had were fabulous -- from high technology to network and cyber security to how it was to be a UMass student back in the days -- late 1960s and early 1970s. He was impressed that UMass dining services are now consistently recognized with national awards and I have even dined on lobster in one of our Dining Commons! Our guest of honor was so engaging and interesting and it was fascinating to discuss some of the challenges faced by industry on the topics above. As someone who loves computer programming, we also had great discussions about computing from mainframe computing and cloud computing to mobile apps. Our guest of honor had lived, as an undergrad, in Southwest, in one of the high rise dorms. He had lived on the 22nd floor (my daughter has freshman friends who now reside on the 21st and 22nd floors and one has an elevator phobia). He was an undergrad during the Richard Gere days (yes, the movie star) and Dr. J. of basketball fame. In our conversations, I noted that UMass students, including those who live in Southwest (many of whom, honestly, love the experience), develop a kind of resiliency that is very useful in their professional careers. Resilient Leadership for an Evolving Business Climate. He responded that the UMass motto maybe should be: UMass Tough, which, frankly, I really like! I told him to suggest this motto to our Chancellor. According to Wikipedia, we do have a motto but, honestly, this is the first time I have ever heard of it. Later, he was going to meet his college room-mate, whom he had not seen in 35 years, and who is an architect in Conway. A delightful time with a wonderful UMass alum. I do hope that we can build some strong partnerships -- he told me that his firm has over 300 UMass alums in high positions. Now that I am back from another wonderful stint in Europe I have some time to reflect on my great experiences as a Visiting Professor in Sweden and as a Guest Professor in Austria. I have blogged over the past several weeks about academic and travel experiences in Europe but today I would like to share with my readers some photos. 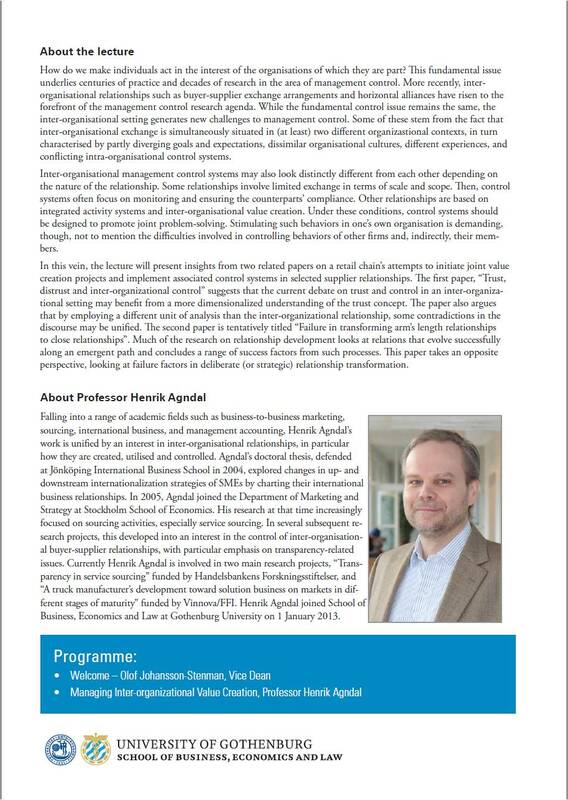 On March 12, 2013, I gave a big seminar at the Vienna University of Economics and Business (WU), after teaching that morning the Humanitarian Logistics and Healthcare course that I was offering there. The seminar was on Perishable Product Supply Chains in Healthcare: Models, Analysis, and Computations and the nice announcement for it is online here. My hosts during my stay in Vienna were Professor Manfred Fischer and Professor Tina Wakolbinger with great hospitality also provided by Dr. Petra Staufer-Steinnocher. I was impressed by the seminar room, in the photos below, with the largest corporate-looking table I had ever seen. I felt like I was the Chairman of General Motors (GM) speaking to my board! I must admit that I do have a connection to one former Chairman of GM and that is to Mr. John F. Smith Jr. (or "Jack" when we converse and correspond). I hold the John F. Smith Memorial Professorship of Operations Management at the Isenberg School of Management, which is named after his father. Both graduated from UMass Amherst and Jack studied Operations Management, whereas his father.had graduated from the Stockbridge School at UMass Amherst. Jack had also been the President and the CEO of GM. He is a fabulous role model and I am sure that he would be delighted to hear that one of my former PhD students, Dr. Tina Wakolbinger, is now the Director of the Supply Chain Management Institute at WU in Vienna. And you can read from The New York Times what Jack Smith did once he stepped down from the board of GM. Transportation, whether by land, or air, is simply in our blood! As for alternative modes of transportation that I saw in Vienna, I liked those below. Enjoy the flowers from Vienna and Happy Spring! In the past 3 weeks I have been on 8 Lufthansa flights -- even the crew on the flight from Munich to Boston on Sunday was impressed. I had spent 3 weeks in Europe, as part of my Visiting Professorship at the University of Gothenburg in Sweden, and also as a Guest Professor in Vienna, Austria. Strangely, there are no direct flights to Sweden from Boston and even to get to Vienna from Gothenburg I had to do a Frankfurt or Munich hop! The flights that I took on Sunday from Gothenburg to Boston via Munich, Germany were all full and, since Sunday I had 18 hours of travel to make it back to Amherst, as a frequent flier, my "secret" is to stretch a lot and to stand on the plane, whenever possible -- I can recite plane configurations in my sleep. While in flight, and after some really interesting conversations with the Lufthansa flight crew in the back (the service and hospitality were fantastic -- THANK YOU! ), a gentleman joined me in the back for some stretching, as well. He actually remarked that it was about time for him to do some yoga exercises. Being an academic, I can spot interesting people easily and since I travel so much and am one of those who truly enjoys even the journey, and that is primarily because of the people that I meet en route, I struck up a conversation. He works in countersurveillance and had recently had an audience with Aung San Suu Kyi, the peace activist, in Burma and Nobel Peace Prize laureate, and had just starred in a play in Berlin. His brilliance was apparent and in our conversation we also talked about Aleksandr Solzhenitsyn, the author of The Gulag Archipelago, and the recipient of the Nobel Prize in Literature. During our conversation on literature, political activism, technology, computer programming, education, and research -- we exchanged business cards and he was intrigued that I was the Director of the Virtual Center for Supernetworks at UMass Amherst. He immediately asked whether I knew Kevin Fu, a cybersecurity expert, and I said, of course, but that he has left UMass to go to Michigan. He also spoke of Susan Landau, the computer scientist, and we discussed computer science colleagues at the University of Washington. He reminded me of Aaron Swartz, so I asked him whether he knew him and he responded that Aaron was a friend, so we spoke about Internet activism, MIT and Harvard, and the great loss that Aaron is no longer with us. Out of the clear blue sky he stated with a smile and glow: "The Best Thing About the US is the National Science Foundation (NSF)!" I exclaimed -- "Wow -- that is so great to hear!" He is now part of a funded project on countersurveillance and I am sure will do great work (and he already has). As a recipient of several NSF grants, including a large one that I am a Co-PI on, I can honestly say that NSF support has been essential to my confidence-building and productivity (when times get tough you can immerse yourself in research and know that you have the support and that you can bring in more PhD students, which is essential to scholarship and education). NSF grants have enabled me to stretch and cross disciplinary boundaries, to delve deeply into new research areas, to work with colleagues across disciplines, and to publish journal articles and books. Several of my former students who have been funded, in part, on my NSF grants, have achieved tenure and even Full Professorships and, when I travel to conferences, time and time again, am told how successful my former students are. An NSF grant gives you the imprimatur to fully stretch yourself and to do courageous research. Thank you, NSF, for being gutsy and visionary, and, as my new airplane colleague attested, being the best thing about the US! And Lufthansa landed in Boston early! I do reget, however, not taking a photo of the snack offered from Gothenburg to Munich that consisted of a triangle of Wiener schnitzel with mashed potatoes seasoned with mustard (very yellow), which I gave to my seat-mate, with whom I had another fascinating conversation about manufacturing in Poland versus Sweden, which I may write about in another post. I had packed up a big bar of Lindt dark chocolate, which I shared, and that pulled me through. In the meantime, continue to do your best work! I am starting to pack up and tomorrow will be flying back to the US. Another fabulous stay as a Visiting Professor at the School of Business, Economics and Law at the University of Gothenburg in Sweden is coming to an end. I guess that they like me, too, since I have been reappointed for another year, which is nice for my sabbatical! Typically, in the US, when we think of an "inauguration" we have in mind the inauguration of the President. In Sweden (and I suspect in other European countries, as well), an inauguration also takes place in academia to recognize a new Full Professor. Since, for the past year, I have been a Visiting Professor at the University of Gothenburg in Sweden, as part of my sabbatical (this is actually my 4th trip back in the past 12 months), I am learning more and more about the academic culture in this great country. Today, I had the distinct pleasure of attending a lecture of the Professor who was being inaugurated. The official invitation is below. The lecture focused on the challenges of interorganizational value creation and discussed recent research in retail and buyer-supplier relationships. Issues of trust, transparency, and the importance of problem domains were emphasized. I was excited to hear quality and supply chains noted. Different relationships offer different potential to create value together. Many words of wisdom were stated including: that trust is a building process but distrust can be caused by a single action. Given how challenging it is for an organization (including a School of Business) to have its individuals incentivized and rewarded in a way that also moves the organization forward, interorganizational challenges and issues of control and management are even more complex. 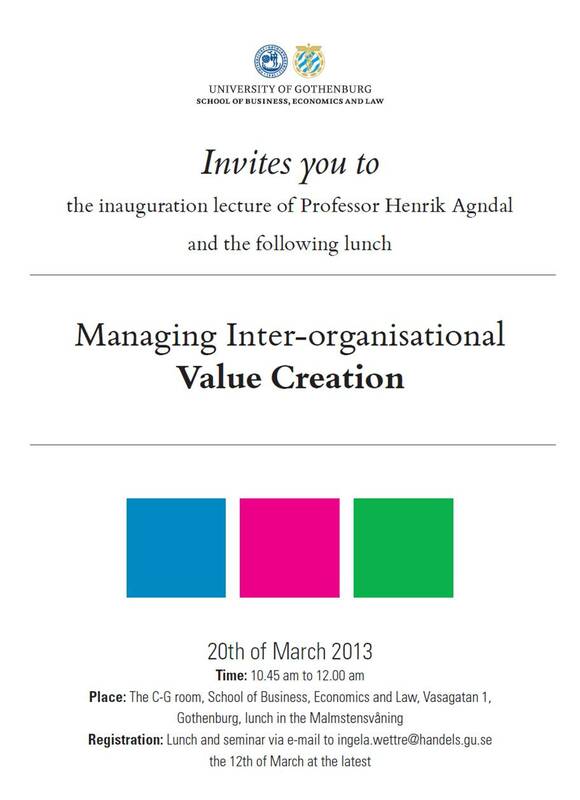 In terms of intraorganizational performance, Professor Agndal emphasized the importance of feeling that you belong, inclusiveness, and creating an atmosphere of support (even more important than monetary rewards). Afterwards, we were invited to a delicious lunch in celebration of our new Professor! 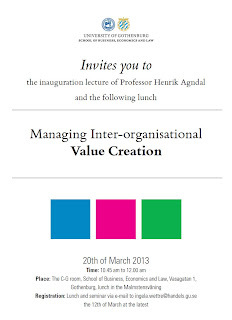 I congratulate Professor Henrik Agndal on his new appointment and on a great event today! I am very excited about being a speaker at The New York Times EnergyForTomorrow Conference with the theme Building Sustainable Cities that will take place next month, April 25, 2013. I will be speaking in the session on Transportation and Traffic. The agenda is thrilling as are the speakers that will be taking part. I will certainly be in great company! I hope to bring an international perspective to the discussions on transportation and traffic given my experiences as an academic and as a globe trotter. For the past three weeks I have been back in Europe -- working as a Visiting Professor at the School of Business, Economics and Law at the University of Gothenburg and living again in glorious Sweden, with a 4 day diversion in Vienna, Austria, where I lectured on perishable product supply chains in healthcare and also instructed an intensive short course Humanitarian Logistics and Healthcare. The Nordic countries, and even Austria, are advancing their focus on sustainability and have implemented transportation policies that are working. For example, Stockholm's congestion pricing scheme, which originated in January 2006, has been deemed a success, as my colleagues at the Royal Institute of Technology (KTH) in Stockholm have shown rigorously in their published research. Gothenburg, the second largest city in Sweden, just this past January instituted a congestion tax or toll and having been here in October and now, I can see a concrete difference in term,s of the traffic reduction. My colleagues tell me how thousands of citizens who own cars were mailed coupons for free public transport for two weeks and have altered their travel behavior. More are coming into the center city to shop on weekends since there is free parking offered in certain parking garages and in the evenings. Since I teach transportation and logistics (among other network-based courses) at the Isenberg School of Management, tolls are a topic that I am very familiar with, especially since my dissertation advisor at Brown University, Professor Stella Dafermos, had contributed to the literature on this topic even back in the 1970s! What a brilliant mind she had and the operations research community lost a female genius when she died at age 49. While in Vienna, I was impressed by the red and black trams/trolleys snaking through the city! Also, the parking charges there are so steep (and one can park on streets for only two hours) that many elect to take public transport instead -- using, typically, a combination of modes for commuting. In fact, none of the students in my class in Vienna had driven a car that morning-- all had taken public transport, or had bicycled, or had walked to the university. 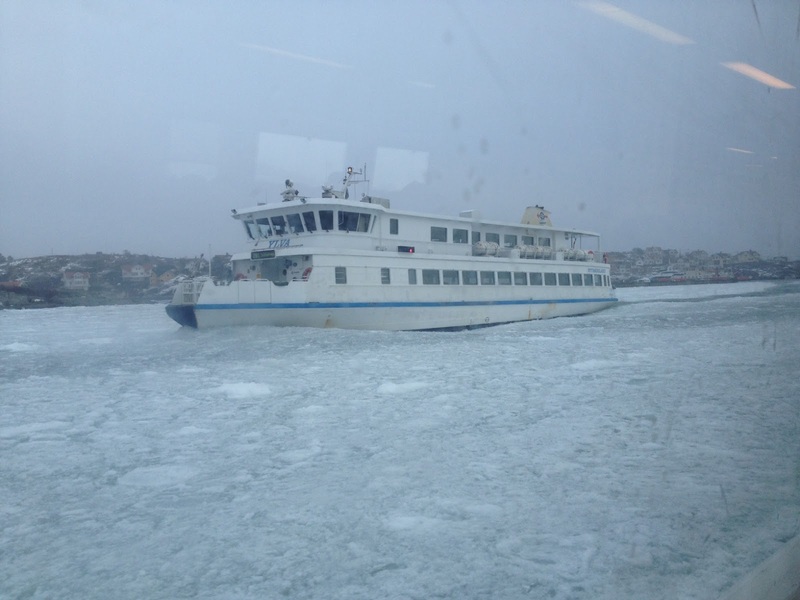 The photos below were taken in Gothenburg and demonstrate the different modes of transport that I (and many others) avail ourselves of. Without transportation there is no mobility and no logistics (just imagine supply chains without transportation -- a topic of my previous post) -- it's not just about the network topologies but how our critical infrastructure is utilized! The top photo was provided by one of my wonderful hosts, Professor Jonas Floden, who has also driven me in the above golf cart on the island where he lives and where cars are banned! Did you know that over one half of the world's population now resides in cities? 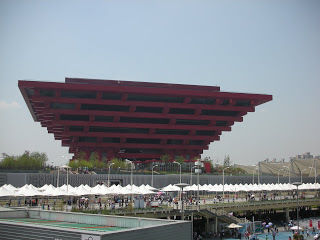 I took all the above photos during speaking engagement trips over the past several years, except for the Shanghai one, which was taken by a former doctoral student of mine at the World Expo there. When cities work well those who live in them can flourish in terms of mobility, health and welfare, accessibility, and innovation. In the paper, "Design of Sustainable Supply Chains for Sustainable Cities," which is now accepted for publication in the journal, Environment & Planning B, I emphasized that cities, as dynamic complex networks, are the systems and the economic engines for commerce, research and development, education, healthcare, and even culture. They have evolved over space and time on built infrastructure from transportation networks to telecommunication and electric power networks. At the same time, cities are the centers of resource usage from electricity and other forms of energy and fuel, to food, water, and a plethora of other products. Hence, they also are the repositories and generators of waste output and other environmental pollutants, such as carbon and other emissions, sewage, noise, etc. The term Sustainable Cities has come into increasing use in the past two decades, with a focus of making cities more livable, with an eye not only on the present generation but towards future ones, as well. Our world is becoming a network of interconnected cities or a supernetwork of cities with urbanization is one of the most pressing and complex challenges of the 21st century, with the citizenry characterized by a growing awareness of a threat to the sustainability of the earth’s natural environment, coupled with the increase in the number of people moving into and living in cities. Cities are supplied by a complex array of supply chains servicing an immense spectrum of economic activities from food stores and restaurants, office supplies and high tech equipment, apparel, construction materials, as well as raw materials, to name just a few. 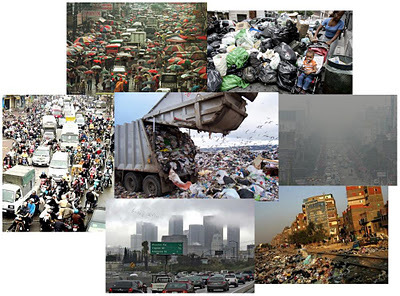 The sustainability of supply chains is, hence, a precursor to the sustainability of our cities. These conditions may well create substantial pressure on current supply chain models. 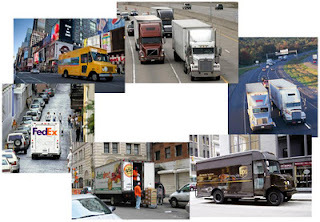 In this paper, I constructed a new computable mathematical model, that is network-based, for the design of sustainable supply chains with a focus on cities that captures the frequency of network link operations, which is especially relevant to cities due to frequent freight deliveries. An algorithm was then proposed, along with convergence results, and implemented for the computation of several numerical examples. One of the goals in the paper was to demonstrate how, through the proper design (and operation) of these complex networks, waste can be reduced, along with the environmental impacts, while minimizing operational and frequency costs, and meeting demand. For a presentation, with the same name, which also includes intellectual foundations inspired by Professor Martin Beckmann, the co-author of the classic book, Studies in the Economics of Transportation, click here. Last night I flew back to Gothenburg, Sweden from Vienna, Austria (through Munich). In Vienna, I had the distinct pleasure of teaching an intensive short course Humanitarian Logistics and Healthcare at the Vienna University of Economics and Business (WU). I also delivered a seminar in the Supply Chain Management Research Seminar Series. WU is one of the largest universities in Europe. The 25 students in my course were all in their final term in the Supply Chain Master's degree program and represented Austria, Germany, Moldova, Bulgaria, Mexico, Turkey, and even the US (a student from Iowa)! They are also writing their dissertations. I learned so much from the students -- the role of the Red Cross in Austria, for example, which is responsible for all the ambulances; how males in Austria have to complete either 6 months of military service or 9 months of civil service -- with quite a few serving for the Red Cross. Females do not do military service but may elect to do civil (community) service and there were students in my course that were ambulance drivers as well as Red Cross volunteers who had helped communities during major snowfalls in Austria by shoveling, along with the fire brigades, snow off of citizens' rooftops. The student from Mexico had worked in rail operations when a major disaster struck there and she told me about the challenges in rerouting freight. A student from Bulgaria who lives near a nuclear power plant and her father works there told us about the emergency preparedness drills there and the alert systems. It was also fascinating to hear about the kinds of warning systems that exist in their communities and countries (some have real shortfalls in this dimension and some are very advanced and sophisticated). The students in the course are now working on their team project papers -- 5 teams of 5 students each with their papers due in 2 weeks. Yesterday, the students gave short presentation to overview their projects, which were fascinating and so professionally well-done. I will be posting them on the class website once they all arrive. We heard about the Fukushima triple disaster, with a focus on the nuclear disaster component, on the Gujarat Indian earthquake, the Indian tsunami, Hurricane Mitch, and the Chernobyl nuclear disaster. I asked the students to focus on a humanitarian organization and what it did do well in terms of disaster relief and what, perhaps, it did not and the lessons that were learned. We covered all phases of disaster relief with vivid case studies as well as performance metrics and even some mathematical models and disaster communications. We covered the differences between commercial and humanitarian supply chains and what possible synergies between the two exist. I commend the Vienna University of Economics and Business on its great programs in terms of both education and research! And it was wonderful to see how my former doctoral student, Dr. Tina Wakolbinger, who is now a Full Professor at WU, is flourishing there. She is the Director of the Research Institute for Supply Chain Management and with her supervision of doctoral students, our academic genealogical "family" tree will be growing. The title of my seminar, which I gave this past Tuesday, was Perishable Product Supply Chains in Healthcare: Models, Analysis, and Computations. I received fabulous questions and feedback and especially enjoyed hearing about the regulations surrounding the pharmaceutical industry in Europe (as opposed to the US). Given the news surrounding drug shortages, especially now in Greece, the seminar was quite timely. Several research directions that are promising will most likely be outgrowths from the discussions. The seminar was based, primarily on our paper, A Supply Chain Generalized Network Oligopoly Model for Pharmaceuticals Under Brand Differentiation and Perishability, Amir H. Masoumi, Min Yu, and Anna Nagurney, Transportation Research E 48: (2012) pp 762-780 but I also related the model to our work on blood supply chains,Supply Chain Network Operations Management of a Blood Banking System with Cost and Risk Minimization, Anna Nagurney, Amir H. Masoumi, and Min Yu, Computational Management Science 9(2): (2012) pp 205-231, and medical nuclear supply chains, Medical Nuclear Supply Chain Design: A Tractable Network Model and Computational Approach, Anna Nagurney and Ladimer S. Nagurney, International Journal of Production Economics 140(2): (2012) pp 865-874. I thank my wonderful hosts: Professor Manfred Fischer, Professor Petra Staufer-Steinnocher, and, of course, Professor Tina Wakolbinger for the outstanding hospitality extended to me! We even ate some classic Viennese cuisine and I returned with so many delicious Austrian chocolates, some of which I will be sharing with my Swedish colleagues this afternoon when we celebrate paper acceptances in journals! As a faculty member at the Isenberg School of Management at UMass Amherst with research and teaching interests in transportation and logistics, operations research / management science, networks and various methodologies, it is important to always be challenging yourself. One great way in which to extend one's horizons is to travel and to live and work abroad. One then brings back new ideas for research and education. In the global economy one has to stretch oneself and experience different cultures and business climates. I have now had a full year's affiliation with the truly excellent Visiting Professor Programme (VPP) at the School of Business, Economics and Law at the University of Gothenburg, Sweden. My first trip/visit to the school was in March 2012, and I also had extended stays in June and this past October. The School has produced a stunning brochure which highlights the Visiting Professors, who come from several countries in Europe, Israel, India, and the US. I am most grateful for the wonderful opportunities that I have had because of this program, whether in giving lectures, helping out with a PhD course in Operations Management, advising doctoral students, taking part in conferences, such as the Future Urban Transport Conference, and having numerous discussions with colleagues, students, staff, and corporate representatives on industry and academic projects. 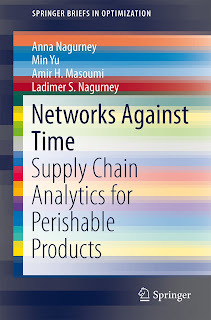 Yesterday, we celebrated the publication of two new books -- the book, "Essentials of Information Systems" by my colleague and host in Gothenburg, Professor Jonas Floden, and my new book, "Networks Against Time: Supply Chain Analytics for Perishable Products," which I co-authored with Professor Min Yu, Amir H. Masoumi, and Professor Ladimer S. Nagurney. I began writing this book while in Gothenburg and it is based on years of multidisciplinary research on supply chains. Dr. Taylan Mavruk, a colleague in Finance, took the photo below -- notice the cakes -- they were quickly eaten. Our group at the School of Business, Economics and Law celebrated the publication of our books with 2 cakes -- a blueberry cream cake and a passion fruit cake with a chocolate ganache crust -- exquisite! As a Visiting Professor I also laud these companies for their foresight and support! It would be admirable and very rewarding if more business schools in the United States (and elsewhere) could initiate similar Visiting Professor Programs to the one at the School of Business, Economics and Law at the University of Gothenburg! I also note that the organization and support provided the visiting faculty is outstanding and so very collegial. Thank you! The student officers of the UMass Amherst INFORMS (Institute for Operations Research and the Management Sciences) emailed me the above photo of the student chapter bulletin board, which they designed to highlight our activities, and which is hanging on the first floor of the Isenberg School of Management. The photo reached me this morning in Sweden, where I am spending a good part of my sabbatical this year (and loving it). As the Faculty Advisor of this student chapter, I have helped the students identify speakers this year and suggest additional academic activities. They have also been terrific at organizing social activities -- our end of the semester parties with international cuisine are not to be missed and are wonderful community events. This year, we have had outstanding speakers come to the Isenberg School because of the initiatives of the UMass INFORMS Student Chapter. We have been highlighting our PhD alums since they serve as wonderful role models for our students. We learned about consulting and analytics from Dr. Davit Khachatryan of Price Waterhouse Coopers, who is based in Arlington, Virginia. From Professor James Benneyan of Northeastern University, who was also supported, in part, by the great INFORMS Speakers Program, we learned about engineering and health care. Professor Jose M. Cruz of the School of Business at UCONN (who was a former doctoral student of mine) spoke about finding an academic job and getting tenure. Most recently, Professor Tina Wakolbinger, who was also a former doctoral student of mine at the Isenberg School, and is now a Full Professor at the Vienna University of Economics and Business, spoke on information systems and electronic recycling. She was the "first" President of our Student Chapter, when it got revitalized back in 2004 and was a co-author of the best practices guide. For her hard work, she received the Judith Liebman Award from INFORMS and I was recognized with the Moving Spirit Award from INFORMS. I also had the pleasure of giving a talk on supply chains through the Computational Social Sciences Initiative at UMass Amherst, which the UMass Amherst INFORMS Student Chapter supported. Another very successful activity this past Fall was prepping for the INFORMS Conference in Phoenix at which students presented their papers for practice and shared their research with others. Soon, the students are hoping to set up a panel of faculty and students to provide advice on finding an academic job. The students in the chapter come from the Isenberg School of Management, the Department of Mechanical and Industrial Engineering, as well as other schools and departments at UMass Amherst. officers get tremendous leadership experience and it is essential to have good, creative officers for the success of a student chapter. For those of you interested in starting or reinvigorating a chapter, you should definitely read the guide. More information on INFORMS Student Chapters can be found on this INFORMS webpage. In 1993, my first book, Network Economics: A Variational Inequality Approach, was published as the first volume of the ACE series: Advances in Computational Economics. The second and revised edition of this book came out in 1999. 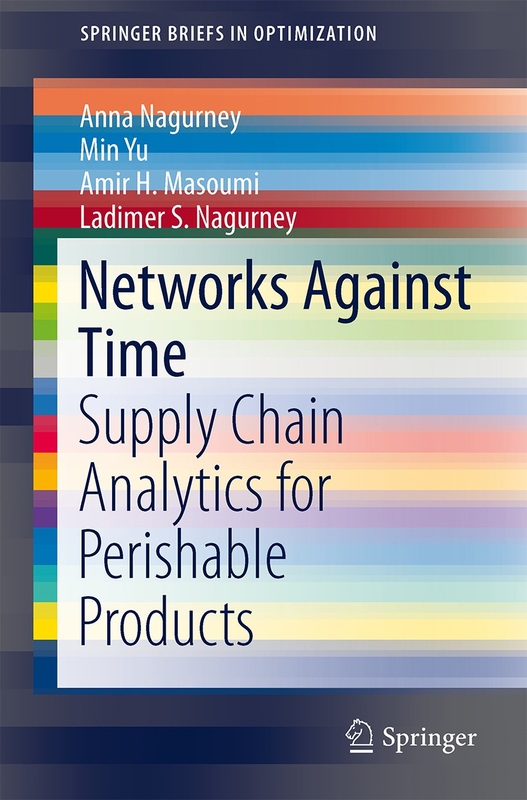 My 10th book, Networks Against Time, was just published by Springer. Since the publication of my Network Economics book, there have been many synergies associated with the modeling of the Internet and other network systems, including decentralized transportation networks, with even the Braess paradox, which was identified in 1968, being relevant also to the Internet. What I find amazing, and actually quite exciting, is that some of the language associated with the Internet is similar to that which we are encountering and using in supply chain networks -- from service providers to transport network providers, to start. I have been involved, since last year, in a truly innovative and challenging project: funded by the National Science Foundation (NSF) entitled Collaborative Research: Network Innovation Through Choice. The investigators on this project are: Dr. Tilman Wolf (lead PI) and Dr. Anna Nagurney (Co-PI) - UMass Amherst; Dr. Jim Griffioen and Dr. Ken Calvert - University of Kentucky; Dr. Ilia Baldine - RENCI at UNC, and Dr. Rudra Dutta and Dr. George Rouskas - NCSU. We have regular teleconferences during which we discuss our research and brainstorm and it is fascinating to be working with such top electrical and computer engineers and computer scientists. Together, we generate many good ideas and the discussions are always very stimulating. There are several doctoral students also involved in this multiyear project. I am supporting, through this grant, one doctoral student in Management Science at the Isenberg School of Management at UMass. The project that we are working on we are calling ChoiceNet and we have two papers with all 7 of us as co-authors: our SIGCOMM paper, "Choice as a Principle in Network Architecture," and an invited paper, "ChoiceNet: Network Innovation Through Choice," that Dr. George Rouskas will be presenting in France next month at the Optical Network Design & Modeling Conference. As we note in the latter paper, The Internet has been amazingly robust to changes in both technology and usage over the past three decades. A large reason for this success has been the fact that users are able to create and deploy a wide range of applications, devices, and services on end-systems around the edge of the network. In addition to enabling the Internet to support new uses that were not envisioned by its creators, this has also led to a vibrant economic environment for innovation at the application layer. The many successful Internet companies that have arisen in the last two decades testify to the ability of a platform on which novel ideas can be developed, tested, and adopted to lead to value creation. Ironically, the same paradigm (i.e., the ability to create new functionality and let users choose winners and losers) is not presently supported inside the network. It is widely agreed that the current Internet architecture inadequately supports adaptation in the data and control planes. In the early days of the Internet, innovations were deployed in the core by consensus among a small community of researchers and operators. With today’s dramatically larger community, consensus is more difficult to achieve and innovation is for the most part limited to the edge. This limitation inhibits the development and deployment of new networking services, protocols, security designs, management frameworks, and other components that are essential to support the increasingly diverse systems, applications, and communication paradigms of the next-generation Internet. We are hoping through a vision for the Internet to offer more choices and this entails the crucial economy plane. Users should not be stuck with contracts over extended time horizons and should be able to dynamically select service and transport network providers. The underlying network economics issues from contracts to game theory models of competition from Cournot and Nash to Bertrand are very intriguing and we have been developing computable game theory models using variational inequality theory and projected dynamical systems theory. Drawing on some results in my first book we are also designing and constructing extensions and pushing the methodological foundations forward. For more information on the NSF Future Internet Architecture (FIA) projects click here. Today I gave a two hour presentation in the Optimization Series at the Chalmers University of Technology in Gothenburg, Sweden. The talk was on Grand Challenges and Opportunities in Supply Chain Networks: From Analysis to Design. I was really looking forward to giving this talk and, as I promised the audience, it is now posted online on the Supernetworks Center website. I enjoyed discussing the importance of decision-making behavior in network systems, from transportation to supply chains and how systems as disparate as electric power generation and distribution networks, the Internet, and financial networks can be reformulated and solved as user-optimized transportation networks. I also overviewed the Braess paradox and had photos of Professor Braess' visit to the Isenberg School of Management at UMass Amherst after we (Braess, Nagurney, and Wakolbinger) had translated his classical 1968 paper and it was published in Transportation Science. I then showed what happens as the demand varies over time. I discussed variational inequality theory and how it can be used to formulate non-cooperative game theory problems under Nash equilibrium. Then, since I am back in the land of H&M, I went deeply into a sustainable fast fashion supply chain model that I had developed with Min Yu and that had been published in the International Journal of Production Economics. This is a competitive supply chain network problem under Nash equilibrium. I discussed our sensitivity analysis results and emphasized how one must bring the supply chain system into analysis to get a realistic picture and results. The audience was terrific and I had great comments and questions. Afterwards, I was taken out to lunch in a cafeteria called Einstein with his portrait as you enter and we ate in an area for faculty. We continued our conversations on the history of science from network design to transportation to tolls. 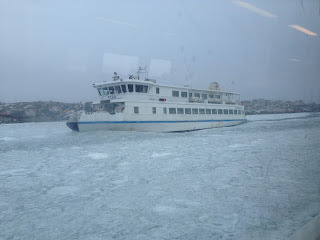 Gothenburg this year instituted tolls and it has been very interesting to see the impacts. It was a great experience and I thank the Optimization Group at Chalmers for being such great hosts! Now I am back in my office at the School of Business, Economics and Law at the University of Gothenburg and it is wonderful to see the staff and my colleagues here. 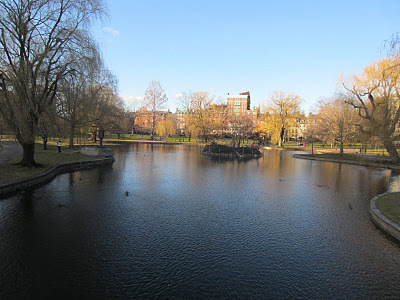 I promised to bring sunshine to Sweden and the days have been beautiful since I arrived this past Friday. Lufthansa must have been using machine intelligence to figure out seat assignments. On my flight from Boston Logan to Frankfurt this past Thursday I was seated to a student from the business school at UMass Boston and then across the aisle from me there was a faculty member from the MIT Sloan School of Management. The former was traveling to the University of Heidelberg where she will be studying German and learning about the culture with her ultimate goal of working in international business as a CPA. The MIT instructor, in turn, was traveling to Istanbul, Turkey (his first trip there) for a short workshop. From the UMass Boston student I learned about her various experiences at universities she had been at (including horror room-mate stories) prior to transferring to UMass Boston. From the faculty member I caught up on what MIT has been doing in terms of entrepreneurship. And there were several other female students on our flight to Frankfurt who were also going to the program at Heidelberg, including an Isenberg School of Management student from the Management Department. The Lufthansa staff was fabulous -- danke schon -- and the flight with 58 rows of seats was filled. I enjoyed the Airbus airplane with bathrooms down the stairs -- good way to stretch and get some exercise. I also met a female postdoc from Portugal who is researching neuroscience at Harvard Medical School who was traveling back to Portugal for a vacation and a family from Nantucket who was going back to White Russia to visit relatives and they were traveling with two very young children. I had a pleasant wait in the Frankfurt airport, where Lufthansa even provided the latest USA Today and International Herald Tribune for the travelers, and then it was time for a short (under 2 hours) flight to Gothenburg. Now I am back in my office at the School of Business, Economics and Law at the University of Gothenburg, drinking my cafe latte, and enjoying being back in glorious Gothenburg, Sweden. I have prepared the lecture on supply chains that I will be giving this coming Monday at the Chalmers University of Technology, as part of its Optimization Seminar series. In my talk, I will provide a broad overview of some of the work that we have done on supply chains and then will delve deeply into our latest work on fast fashion and sustainability -- perfect since I am now back in the world of H&M.